Objective: To develop evidence-based recommendations for the management of systemic glucocorticoid (GC) therapy in rheumatic diseases. Methods: The multidisciplinary guideline development group from 11 European countries, Canada and the USA consisted of 15 rheumatologists, 1 internist, 1 rheumatologist–epidemiologist, 1 health professional, 1 patient and 1 research fellow. The Delphi method was used to agree on 10 key propositions related to the safe use of GCs. A systematic literature search of PUBMED, EMBASE, CINAHL, and Cochrane Library was then used to identify the best available research evidence to support each of the 10 propositions. The strength of recommendation was given according to research evidence, clinical expertise and perceived patient preference. Results: The 10 propositions were generated through three Delphi rounds and included patient education, risk factors, adverse effects, concomitant therapy (ie, non-steroidal anti-inflammatory drugs, gastroprotection and cyclo-oxygenase-2 selective inhibitors, calcium and vitamin D, bisphosphonates) and special safety advice (ie, adrenal insufficiency, pregnancy, growth impairment). Conclusion: Ten key recommendations for the management of systemic GC-therapy were formulated using a combination of systematically retrieved research evidence and expert consensus. There are areas of importance that have little evidence (ie, dosing and tapering strategies, timing, risk factors and monitoring for adverse effects, perioperative GC-replacement) and need further research; therefore also a research agenda was composed. Since 1948, glucocorticoids (GCs) have been widely used in medicine.1 Although GCs soon became associated with the occurrence of adverse effects (AEs), they are still the most frequently used anti-inflammatory and immune-suppressive drugs in rheumatic diseases. Recent studies have demonstrated the disease-modifying potential of low-dose GCs in rheumatoid arthritis (RA) and this has renewed the debate on the risk–benefit ratio of this treatment.2 Current literature on the risk–benefit ratio of GCs is nevertheless inconsistent, and inappropriate use of GCs could lead to increased toxicity;3 this emphasises the need for clear statements on proper use of GCs. Hence, a EULAR task force on GCs, including a patient, was formed to develop evidence-based recommendations, to provide a tool for the better use and management of GC-therapy in rheumatic diseases. Endorsed by EULAR-ESCISIT, a multidisciplinary guideline development committee on GCs was formed, consisting of 20 experts in the field of GCs from 11 European countries, Canada and the USA: 15 rheumatologists, 1 internist, 1 rheumatologist–epidemiologist, 1 health professional, 1 patient and 1 research fellow. The Delphi method was used to agree on 10 key propositions related to the risk–benefit ratio of GCs, and EULAR standardised operating procedures4 were then followed: (1) to identify and critically appraise research evidence for the 10 propositions, performing a systematic literature search of PUBMED, EMBASE, CINAHL and Cochrane Library; (2) to generate and validate recommendations based on the best available evidence, according to research, clinical expertise and perceived patient preference (levels of evidence are defined in table 1); and (3) to formulate a future research agenda. First, a general literature search was performed (appendix 1 of the full version of the article; available web-only at http://www.annrheumdis.com/supplemental), including the estimated incidence of different types of AEs as derived from studies reporting on frequencies of AEs of GCs (see fig 1 and table 2). Second, after the taskforce experts had discussed the results of this general literature search, the Delphi exercise was initiated. At the start, 153 (partly overlapping) propositions were produced, and after 2 anonymous Delphi rounds 10 final propositions were agreed upon (table 3). Third, proposition-specific searches were done, resulting in 5089 potentially useful studies, of which 165 were included to provide (circumstantial) evidence for propositions (table 4). Figure 1 Different study populations of the included studies from the general search. 1. The adverse effects of glucocorticoid therapy should be considered and discussed with the patient before glucocorticoid therapy is started. This advice should be reinforced by giving information regarding glucocorticoid management. If glucocorticoids are to be used for a more prolonged period of time, a “glucocorticoid card” is to be issued to every patient, with the date of commencement of treatment, the initial dosage and the subsequent reductions and maintenance regimens. 2. Initial dose, dose reduction and long-term dosing depend on the underlying rheumatic disease, disease activity, risk factors and individual responsiveness of the patient. Timing may be important, with respect to the circadian rhythm of both the disease and the natural secretion of glucocorticoids. Dosing strategies were assessed in one retrospective and three prospective studies on short- to intermediate-term GC treatment in polymyalgia rheumatica (PMR) and giant cell arthritis (GCA) patients needing low initial dosages had fewer relapses and lower maintenance dose, and experienced less toxicity (category III).13–16 In early RA (disease duration <2 years), the use of low-dose GCs is based not solely on disease symptoms, but also on joint sparing effects on the long-term, as GCs can be categorised as disease-modifying antirheumatic drugs (DMARDs) (category IA).2 Different regimens with GCs have been used for joint sparing purposes in early RA, usually in combination with other DMARDs. These different schemes could result in different disease outcomes, but data are lacking. A relation between dose strategies and risk factors, such as diabetes, hypertension and osteoporosis, can only be shown indirectly (category IIB–III).17–20 It is unknown whether an individual response on the same GC-dose is different among individuals, since no study was found on the relation between dose strategies and individual responsiveness of patients. The timing of GC-administration might influence its efficacy, as both signs and symptoms (such as morning stiffness) of RA21 as well as serum levels of several pro-inflammatory cytokines22 show a circadian rhythm with a flare at the beginning of the day. Administration of GCs early in the morning23 (category IB), or the use of modified release tablet of prednisone, delivering the GC early in the morning (abstract)24 gave more improvement of RA symptoms than conventional timing of GC-therapy. In conclusion, there is category III evidence on dosing regimens of GCs in PMR/GCA and category IA evidence showing a benefit for the use of low-dose long-term GCs in early RA. The relation between risk factors, AEs, high GC-dosages and long-term GC-use was indirectly shown for diabetes (category IIB) and hypertension (category III). No study was identified on individual responsiveness to GC (category IV). There are category IB data on a superior effect of circadian administration of GCs. 3. When it is decided to start glucocorticoid treatment, comorbidities and risk factors for adverse effects should be evaluated and treated where indicated. These include hypertension, diabetes, peptic ulcer, recent fractures, presence of cataract or glaucoma, presence of (chronic) infections, dyslipidemia and co-medication with non-steroidal anti-inflammatory drugs. Even though the above-mentioned risk factors for GC-associated AEs are well known,25 and there is obvious face validity trying to prevent these from occurring by assessing and treating comorbidities and risk factors at baseline, there is no evidence to show that this is effective (category IV). 4. For prolonged treatment, the glucocorticoid dosage should be kept to a minimum, and a glucocorticoid taper should be attempted in case of remission or low disease activity. The reasons to continue glucocorticoid therapy should be checked regularly. This proposition is supported by expert opinion alone, although this proposition has obvious face validity, since the occurrence of GC-related AEs, osteoporosis in particular (proposition 5 and 6), is dependent on dose and duration of therapy. 5. During treatment, patients should be monitored for body weight, blood pressure, peripheral oedema, cardiac insufficiency, serum lipids, blood and/or urine glucose and ocular pressure depending on individual patient’s risk, glucocorticoid dose and duration. There is no direct evidence from appropriately designed studies to support this proposition (category IV). Since risks of AEs during GC-treatment are related to GC-dose and duration of treatment, monitoring should be dependent on both variables. Furthermore, monitoring for an AE is especially useful if the AE is preventable or treatable, common, severe, and if the cost of screening is low and monitoring is feasible in daily clinical practice. Also, non-modifiable AEs should be assessed, as they could be important from the patient’s perspective and could be a surrogate marker for other AEs (eg, reflecting patient’s sensitivity to GCs), alerting the physician. A theoretical framework showing elements of the discussion on monitoring the above-mentioned AEs is found in table 5, based upon group consensus after discussing all propositions. 6. If a patient is started on prednisone ⩾7.5 mg daily and continues on prednisone for more than 3 months, calcium and vitamin D supplementation should be prescribed. Antiresorptive therapy with bisphosphonates to reduce the risk of glucocorticoid-induced osteoporosis should be based on risk factors, including bone-mineral density (BMD) measurement. Calcium and vitamin D supplementation have been shown to reduce GC-induced bone loss and fractures (category IA).26 27 However, they do not totally prevent GC-induced bone loss, in contrast to bisphosphonates, which have been proven superior in this respect (category IA).28 Bisphosphonate therapy can be indicated, based on the following risk factors: decreased BMD, female gender, older age, postmenopausal status and low body mass index (category IIB).29 Both GC-dose and low BMD have been shown to be predictors of fractures, but at the same BMD level, postmenopausal patients on GCs were more prone to getting fractures than postmenopausal patients without this therapy (category 1B).30 The ACR has published a clear guideline on the treatment of GC-induced osteoporosis,31 and several algorithms have been proposed to decide whether or not to start with bisphosphonates based on GC-dosage, pre-existent fractures, age and gender, menopause, and BMD measurement32 33 (fig 2 gives an example). Figure 2 Example of an algorithm for osteoporosis prevention in glucocorticoid users. 7. Patients treated with glucocorticoids and concomitant non-steroidal anti-inflammatory drugs (NSAIDs) should be given appropriate gastro-protective medication, such as proton pump inhibitors (PPIs) or misoprostol, or alternatively could switch to a cyclo-oxygenase-2 selective inhibitor (coxib). 8. All patients on glucocorticoid therapy for longer than 1 month, who will undergo surgery, need perioperative management with adequate glucocorticoid replacement to overcome potential adrenal insufficiency. GC-replacement is recommended in case of surgery for patients at risk of adrenal insufficiency (category IV). For moderate physical stress-inducing procedures, a single dose of 100 mg of hydrocortisone intravenously has been proposed, and for major surgery, 100 mg of hydrocortisone intravenously before anaesthesia and every 8 h 4 times thereafter.53 The dose can be gradually tapered by half per day afterwards. However, several other schemes of GC-replacement exist. 9. Glucocorticoids during pregnancy have no additional risk for mother and child. Safety of GC-usage during pregnancy refers to both the mother and the unborn child. First, for the pregnant mother, the spectrum of AEs associated with the use of GCs is believed not to differ between a pregnant patient and a non-pregnant patient (category IV evidence), but since pregnant or lactating women are more at risk for pregnancy-associated Aes, which are also seen as AE of GC-therapy (eg, osteoporosis,54 diabetes,55 hypertension56), this risk of these AEs could be especially increased by GC-therapy for these women, but no data are available. 10. Children receiving glucocorticoids should be checked regularly for linear growth and considered for growth-hormone replacement in case of growth impairment. GCs can cause growth retardation in children (category I B).66–69 The pathogenesis of this growth impairment is multifaceted. Growth-hormone replacement (GHR) can be used to prevent growth impairment due to GCs: an increase in linear growth with GHR was shown in several studies of GC-using JIA patients (category I–III),70–75 and in studies of “slowly growing GC-treated patients” (category II).76 77 The daily GC-doses used in these studies varied between 0.2 and 0.5 mg/kg prednisolone equivalent, and the duration GHR therapy was 2–4 years. If GHR is considered, referral to an experienced paediatrician is indicated (category IV evidence), and additional testing can confirm growth-hormone deficiency. Routine usage of GHR in GC-using patients is hampered by several factors: the therapy involves daily injections (subcutaneously or intramuscularly), the length gain is relatively small, and it is a very costly therapy (between €15 000 and €50 000 annually, depending on the weight of the individual child78). This EULAR document on the safer use of systemic GCs in rheumatic diseases used a similar design to that of earlier EULAR taskforces,79–82 i.e. a combination of both evidence and expert opinion. The added value of this taskforce, like previous ones, is provided by the fact that they (1) are a broad representation of experts in the field of GCs within and outside Europe; (2) use recent research data; and (3) use a thorough evidence-based format. The order of 10 propositions in the paper does not reflect importance, but more or less the logical order of patient management. Both the level of evidence of each proposition and the strength of recommendations are given. This approach has led to a reduction of personal bias, good external validity and generalisability, and clear identification of areas of clinical practice where more research data are required.83 The propositions promote the safer use of GCs among physicians and patients alike in daily clinical practice, and they will form the basis of further EULAR research and education. These recommendations have some limitations. Since GCs are used quite extensively, the search results were often overwhelming. To overcome this, we used more specific search strategies in which relevant studies might have been overlooked. Second, the selection of circumstantial evidence in the absence of direct evidence has some degree of subjectivity. Third, in the literature, the evidence hierarchy has focused on treatment efficacy, whereas evidence on safety might be better graded by other study types than RCTs. Other grading systems might be preferred for grading future studies on safety. The literature search showed that studies on GCs in general lack a systemic assessment of AEs and that AEs often are poorly described, let alone defined, which made it difficult to provide direct evidence for most propositions. It is therefore advisable to monitor a well-defined list of AEs in a standardised manner in future studies, taking into account patients’ perspectives, but standardised scoring for most AEs has yet to be developed. Hypertension, diabetes, osteoporosis, gastric ulcer, cataract, glaucoma, infections, and dyslipidaemia are AEs that merit monitoring. To point out the most important topics for future research on GCs, a research agenda of 11 research questions has been formulated through 2 additional Delphi rounds (table 6). Professor H Capell, Centre for Rheumatic Diseases, Royal Infirmary Glasgow, Scotland, UK, participated in the taskforce during the Delphi exercises.
. Glucocorticoid therapy for immune-mediated diseases: basic and clinical correlates. Ann Intern Med 1993;119:1198–208.
. Effects of glucocorticoids on radiological progression in rheumatoid arthritis. Cochrane Database Syst Rev 2007.
. Review: corticosteroid usage: observations at a community hospital. Am J Med Sci 1996;311:234–9. Anon. Good safety information practices. In: Guidelines for preparing core clinical safety information on drugs—Report of CIOMS Working Group III. Geneva: WHO, 1995.
. Population-based assessment of adverse events associated with long-term glucocorticoid use. Arthritis Care Res 2006;55:420–6.
. Preference for fractures and other glucocorticoid-associated adverse effects among rheumatoid arthritis patients. Med Decis Making 2001;21:122–32.
. A problem-based education program for patients with rheumatoid arthritis: evaluation after three and twelve months. Arthritis Care Res 1997;10:325–32.
. Methotrexate patient education: a quality improvement study. Arthritis Care Res 1996;9:216–22.
. Effective methods of giving information in cancer: A systematic literature review of randomized controlled trials. J Public Health Med 2001;23:227–34.
. Impact of patient knowledge, patient–pharmacist relationship, and drug perceptions on adverse drug therapy outcomes. Pharmacotherapy 1998;18:333–40.
. Report of erectile dysfunction after therapy with beta-blockers is related to patient knowledge of side effects and is reversed by placebo. Eur Heart J 2003;24:1928–32.
. Prednisolone maintenance dose in relation to starting dose in the treatment of polymyalgia rheumatica and temporal arteritis. A prospective two-year study in 273 patients. Scand J Rheumatol 2001;30:260–7.
. Treatment of polymyalgia rheumatica and giant cell arteritis. I. Steroid regimens in the first two months. Ann Rheum Dis 1989;48:658–61.
. Relapse in a population based cohort of patients with polymyalgia rheumatica. J Rheumatol 2005;32:65–73.
. Efficacy and adverse effects of different corticosteroid dose regimens in temporal arteritis: a retrospective study. Clin Exp Rheumatol 1997;15:303–6.
. A 6-year prospective study on new onset diabetes mellitus, insulin release and insulin sensitivity in renal transplant recipients. Nephrol Dial Transplant 2003;18:2154–9.
. The impact of impaired insulin release and insulin resistance on glucose intolerance after renal transplantation. Clin Transplant 2002;16:389–96.
. Insulin resistance after renal transplantation: the effect of steroid dose reduction and withdrawal. J Am Soc Nephrol 2004;15:3233–9.
. Role of steroid dose in hypertension early after liver transplantation with tacrolimus (FK506) and cyclosporine. Transplantation 1996;62:1588–92.
. Domiciliary self-measurement in the rheumatoid arthritis and the demonstration of circadian rhythmicity. 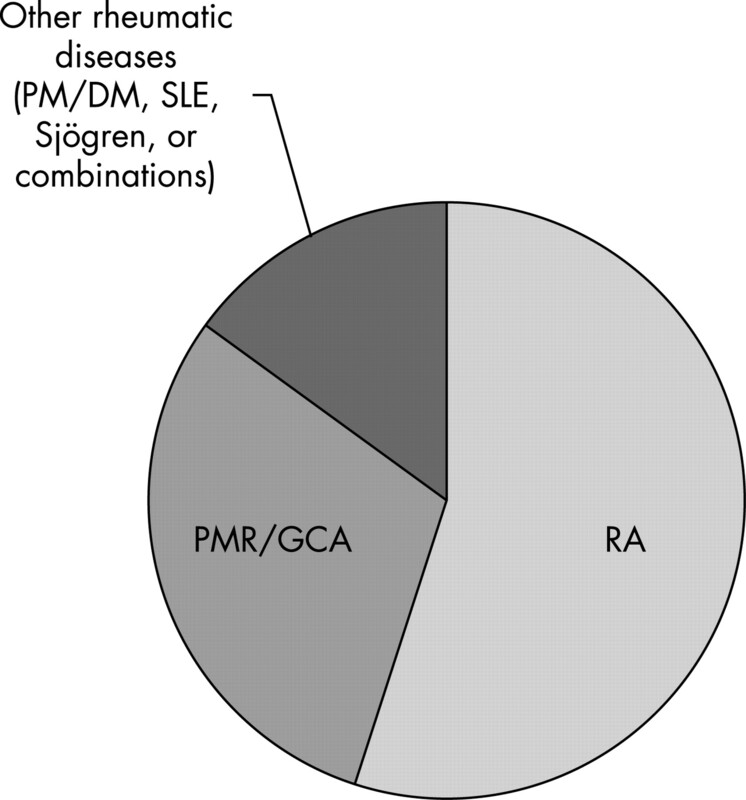 Ann Rheum Dis 1982;41:453–5.
. Circadian rhythms in rheumatoid arthritis: Implications for pathophysiology and therapeutic management. Arthritis Rheum 2007;56:399–408.
. The timing of glucocorticoid administration in rheumatoid arthritis. Ann Rheum Dis 1997;56:27–31.
. New modified-release (MR) tablet formulation of prednisone significantly reduces duration of morning stiffness compared to standard prednisone in subjects with rheumatoid arthritis (RA). Arthritis Rheum 2006;54:4036 (abstract).
. Calcium and vitamin D for corticosteroid-induced osteoporosis. Cochrane Database Syst Rev 2000;CD000952.
. Prevention and treatment of glucocorticoid-induced osteoporosis with active vitamin D3 analogues: a review with meta-analysis of randomized controlled trials including organ transplantation studies. Osteoporos Int 2004;15:589–602.
. Bisphosphonates for steroid induced osteoporosis. Cochrane Database Syst Rev 2000;CD001347.
. Data driven attempt to create a clinical algorithm for identification of women with rheumatoid arthritis at high risk of osteoporosis. Ann Rheum Dis 2000;59:805–11.
. Bone density threshold and other predictors of vertebral fracture in patients receiving oral glucocorticoid therapy. Arthritis Rheum 2003;48:3224–9. Anon. Recommendations for the prevention and treatment of glucocorticoid-induced osteoporosis: 2001 update. American College of Rheumatology Ad Hoc Committee on Glucocorticoid-Induced Osteoporosis. Arthritis Rheum 2001;44:1496–503.
. Prevention of glucocorticoid osteoporosis: a consensus document of the Dutch Society for Rheumatology. 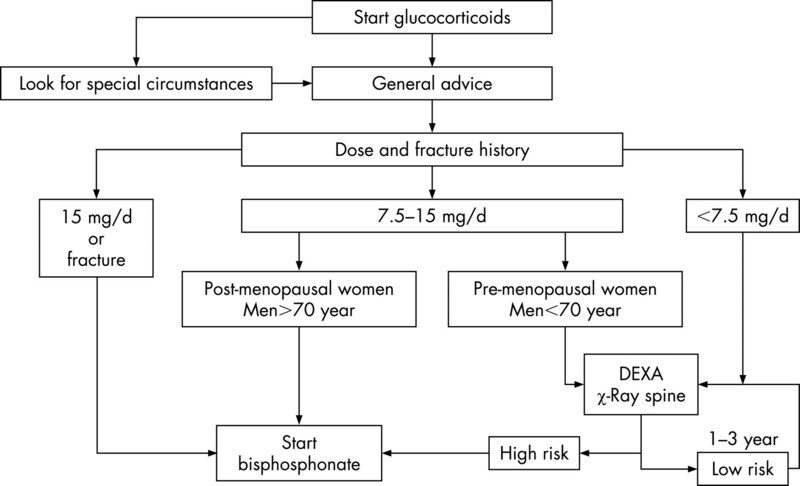 Ann Rheum Dis 2004;63:324–5.
. A UK Consensus Group on management of glucocorticoid-induced osteoporosis: an update. J Intern Med 1998;244:271–92.
. The effectiveness of five strategies for the prevention of gastrointestinal toxicity induced by non-steroidal anti-inflammatory drugs: systematic review. BMJ 2004;329:948.
. Prevention of NSAID-induced gastroduodenal ulcers. Cochrane Database Syst Rev 2002;CD002296.
. Comparison of upper gastrointestinal toxicity of rofecoxib and naproxen in patients with rheumatoid arthritis. VIGOR Study Group. N Engl J Med 2000;343:1520–8.
. Gastrointestinal toxicity with celecoxib vs nonsteroidal anti-inflammatory drugs for osteoarthritis and rheumatoid arthritis: the CLASS study: A randomized controlled trial. Celecoxib Long-term Arthritis Safety Study. JAMA 2000;284:1247–55.
. Efficacy, tolerability, and upper gastrointestinal safety of celecoxib for treatment of osteoarthritis and rheumatoid arthritis: systematic review of randomised controlled trials. BMJ 2002;325:619.
. Comparing rates of dyspepsia with coxibs vs NSAID+PPI: A meta-analysis. Am J Med 2006;119:448.
. Cardiovascular events associated with rofecoxib in a colorectal adenoma chemoprevention trial. N Engl J Med 2005;352:1092–102.
. Cardiovascular outcomes with etoricoxib and diclofenac in patients with osteoarthritis and rheumatoid arthritis in the Multinational Etoricoxib and Diclofenac Arthritis Long-term (MEDAL) programme: a randomised comparison. Lancet 2006;368:1771–81.
. Rofecoxib for rheumatoid arthritis. Cochrane Database of Systematic Reviews: Reviews 2005 Issue 1 John Wiley, Chichester, UK. DOI: 10 1002/14651858 CD003685 pub2 2005.
. Do selective cyclo-oxygenase-2 inhibitors and traditional non-steroidal anti-inflammatory drugs increase the risk of atherothrombosis? Meta-analysis of randomised trials. Br Med J 2006;332:1302–5.
. Cardiovascular risk and inhibition of cyclooxygenase: a systematic review of the observational studies of selective and nonselective inhibitors of cyclooxygenase 2. JAMA 2006;296:1633–44.
. Cardiovascular risk associated with celecoxib in a clinical trial for colorectal adenoma prevention. N Engl J Med 2005;352:1071–80.
. Postoperative collapse due to adrenal insufficiency following cortisone therapy. Lancet 1957;272:1167–70.
. Hypothalamic–pituitary–adrenocortical and gonadal functions in rheumatoid arthritis. Ann NY Acad Sci 2003;992:107–17. Anon. AHFS drug information. Bethesda: 2001.
. Evaluation of the pituitary–adrenal axis function following single intraarticular injection of methylprednisolone. Arthritis Rheum 2005;52:924–8.
. Adrenocortical responsiveness after alternate-day corticosteroid therapy. N Engl J Med 1968;278:405–9.
. The effect of long-term glucocorticoid therapy on pituitary–adrenal responses to exogenous corticotropin-releasing hormone. N Engl J Med 1992;326:226–30.
. Predictors and outcomes of scleroderma renal crisis: the high-dose versus low-dose d-penicillamine in early diffuse systemic sclerosis trial. Arthritis Rheum 2002;46:2983–9.
. Up to Date (http://www.utdol.com): Treatment of adrenal insufficiency. (accessed 19 Oct 2006).
. Pregnancy and lactation confer reversible bone loss in humans. Osteoporos Int 2001;12:828–34.
. Treatments for gestational diabetes and impaired glucose tolerance in pregnancy. Cochrane Database Syst Rev 2003;CD003395.
. Diagnosis and management of gestational hypertension and preeclampsia. Obstet Gynecol 2003;102:181–92.
. In vitro metabolism of prednisolone, dexamethasone, betamethasone, and cortisol by the human placenta. Am J Obstet Gynecol 1977;127:264–7.
. Cleft palate in the mouse: a teratogenic index of glucocorticoid potency. Science 1965;147:402–3.
. Retardation of fetal growth in patients receiving immunosuppressive therapy. N Engl J Med 1985;313:328. Anon. Food and Drug Administration. FDA categories for drug use in pregnancy. 44, 37434–67. 2006. Fed Regist 1980.
. Corticosteroid therapy for the pregnant asthmatic patient. JAMA 1975;233:804–7.
. Effect of antepartum glucocorticoid administration upon neonatal respiratory distress syndrome and perinatal infection. Am J Obstet Gynecol 1984;148:178–86.
. Letter: Entry of prednisone into human milk. N Engl J Med 1975;293:1154.
. Prednisolone excretion in human milk. J Pediatr 1985;106:1008–11. Anon. Transfer of drugs and other chemicals into human milk. Pediatrics 2001;108:776–89.
. Linear growth and final height in patients with systemic juvenile idiopathic arthritis treated with longterm glucocorticoids. J Rheumatol 2002;29:1296–300.
. Adult height in patients with early onset of Crohn’s disease. Gut 2002;51:26–9.
. A meta-analysis of the effect of oral and inhaled corticosteroids on growth. J Allergy Clin Immunol 1994;93:967–76.
. Risk of persistent growth impairment after alternate-day prednisone treatment in children with cystic fibrosis. N Engl J Med 2000;342:851–9.
. Efficacy of recombinant human growth hormone in children with juvenile rheumatoid arthritis and growth failure. J Pediatr Endocrinol Metab 2000;13:899–905.
. GH therapy in juvenile chronic arthritis: results of a two-year controlled study on growth and bone. J Clin Endocrinol Metab 2001;86:5737–44.
. Growth hormone improves height in patients with juvenile idiopathic arthritis: 4-year data of a controlled study. J Pediatr 2003;143:512–9.
. Growth hormone treatment in children with rheumatic disease, corticosteroid induced growth retardation, and osteopenia. Arch Dis Child 2006;91:56–60.
. Effects on growth and body composition of growth hormone treatment in children with juvenile idiopathic arthritis requiring steroid therapy. J Rheumatol 2003;30:2492–9.
. Stimulation of collagen synthesis and linear growth by growth hormone in glucocorticoid-treated children. Pediatrics 1992;89:416–21.
. Treatment of glucocorticoid-induced growth suppression with growth hormone. National Cooperative Growth Study. J Clin Endocrinol Metab 1998;83:2824–9.
. Growth hormone therapy for short stature: is the benefit worth the burden? Pediatrics 2006;118:343–8.
. EULAR evidence based recommendations for the management of hip osteoarthritis: report of a task force of the EULAR Standing Committee for International Clinical Studies Including Therapeutics (ESCISIT). Ann Rheum Dis 2005;64:669–81.
. EULAR evidence based recommendations for gout. Part II: Management. Report of a task force of the EULAR Standing Committee for International Clinical Studies Including Therapeutics (ESCISIT). Ann Rheum Dis 2006;65:1312–24.
. EULAR evidence based recommendations for the management of hand osteoarthritis—report of a task force of the EULAR Standing Committee for International Clinical Studies Including Therapeutics (ESCISIT). Ann Rheum Dis 2007;66:377–88.
. EULAR evidence based recommendations for gout. Part I: Diagnosis. Report of a task force of the Standing Committee for International Clinical Studies Including Therapeutics (ESCISIT). Ann Rheum Dis 2006;65:1301–11.
. Low dose long-term corticosteroid therapy in rheumatoid arthritis: an analysis of serious adverse events. Am J Med 1994;96:115–23.